When the Massachusetts men’s basketball team takes the floor on Friday night, it will showcase a lineup and roster stock piled with athleticism and depth. 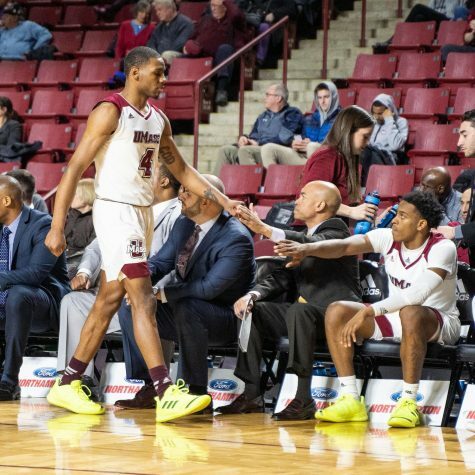 UMass is filled with a balance of returning players and newcomers, offering plenty of depth and experience that should allow the Minutemen to have effective rotations and quality substitutions without a drop in productivity from the starting five to the bench. 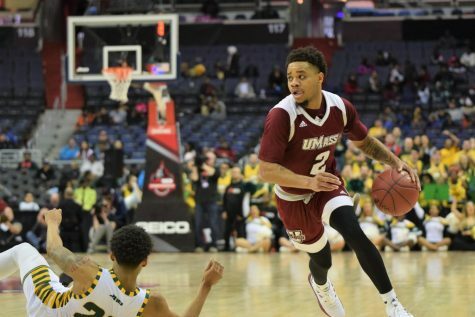 Returning in the backcourt for UMass are juniors Javorn Farrell and Freddie Riley. 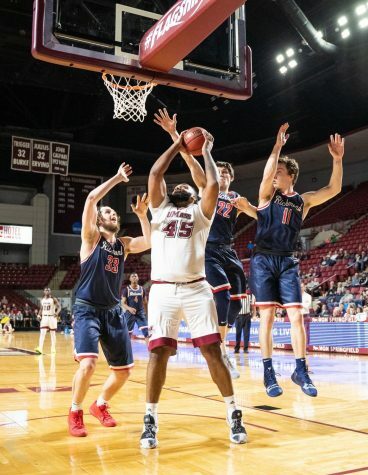 Farrell was second in scoring last season for the Minutemen behind Anthony Gurley, averaging an output of 8.5 points per contest. The Woodbridge, Va. started 16 games a year ago and is likely to see a majority of his playing time come at the small forward position. Riley will see an increased role this season at the shooting guard spot. The Ocala, Fla. native primarily came off the bench in his sophomore campaign, but will be counted on to build off of his eight points per game average from a year ago. Kellogg has a great deal of confidence in Riley, who showed promise with seven games scoring in double figures a year ago including a 28-point outburst in last year’s season opener against Rider. “If I give him an opportunity to shoot the ball and have some freedom, I think he’ll put the ball in the basket,” said Kellogg. Fellow junior Terrell Vinson returns after starting 28 of 30 games last season and should continue to factor into the starting rotation at forward after averaging 6.5 points and 4.4 rebounds per game. Senior Sean Carter resumes his spot in the post, as the 6-foot-9 Fayetteville, N.C. native lead last year’s unit with 6.3 rebounds a game. Fellow seniors Matt Hill and Trey Lang also return for their final seasons at UMass. Rounding out the returning Minutemen are junior forward Sampson Carter and sophomores Jessie Morgan and Raphiael Putney at guard and power forward respectively. Kellogg expects Putney to have a greater role this season after only averaging 12.7 minutes per game last season, and he has been impressed with his scoring around the basket in the preseason and practice. Morgan will be used in a variety of ways coming off the bench, including playing some point guard. Kellogg hopes that the Philadelphia native and Riley can be on the floor at the same time in order to have two threats on the perimeter for the opposition to respect. Morgan is prepared to fill whatever role necessary to help the team. “I’m just trying to do whatever it takes to put my team in a position to win,” he said. 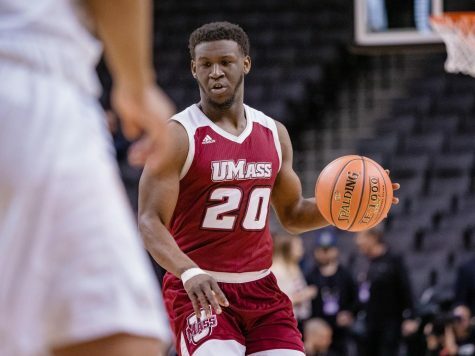 The UMass program welcomes five newcomers to its roster, highlighted by sophomore point guard Chaz Williams. Williams, from Brooklyn, N.Y., transferred from Hofstra after a rookie campaign that earned him a selection to the 2010 Colonial Athletic Association All-Freshman team. 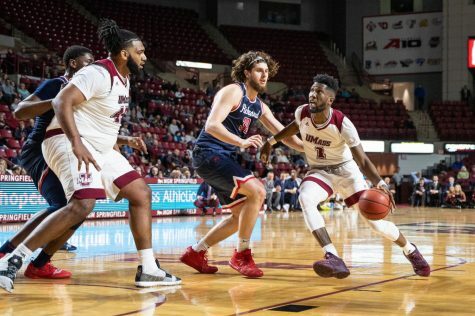 During that season, he averaged 9.8 points and 4.2 assists per game, which should help UMass’ new offensive system tremendously by having a reliable player running its sets. Kellogg and the rest of the coaching staff have big expectations for Williams, with Kellogg assuring that his new point guard will be in the starting lineup on Friday night. Redshirt freshman Maxie Esho joins the Minutemen roster after taking a redshirt season a year ago. The forward from Upper Marlboro, Md. 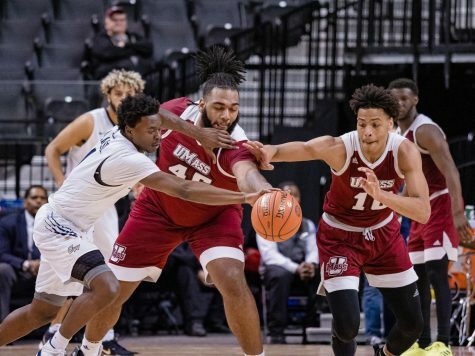 should serve as a specialty player, said Kellogg, who feels his athleticism makes him a prime front man on UMass’ full-court press. Freshman forward Cady Lalanne enters his first of eligibility with the Minutemen after attending UMass last year but was unable to play due to NCAA rules. Lalanne was selected to the Atlantic 10 preseason All-Rookie Team and averaged 21 points, 13 rebounds and four blocks in his senior season at Oak Ridge High School in Orlando, Fla. The Minutemen also welcome walk-on Andrew McCarthy, a 7-foot-1 center from Scituate. 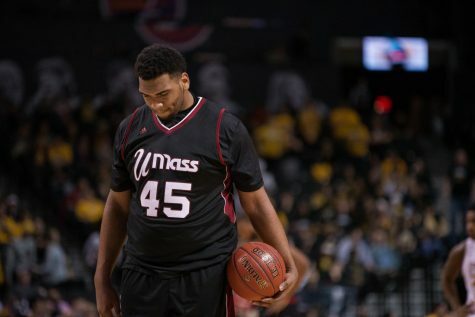 McCarthy becomes just the third seven-footer in the program’s history to suit up for UMass, with Luke Bonner and Jeff Meyer as the only others. Kellogg plans on being patient with McCarthy as he tries to complete his game but added that he could be called upon to help matchup against an opponent’s big man that is giving the other post players difficulties. The final newcomer is freshman guard Jordan Laguerre, who was ruled ineligible to play this season by the NCAA. The Manchester, N.H. native will serve as a partial qualifier, which allows him the freedom to practice with the team. However, the freshman cannot travel with the team or suit up on game day. Despite his ineligibility, Laguerre has impressed Kellogg and the rest of the team with his work ethic and ability. “I think success comes for those type of kids because he won’t accept anything less,” said Kellogg. 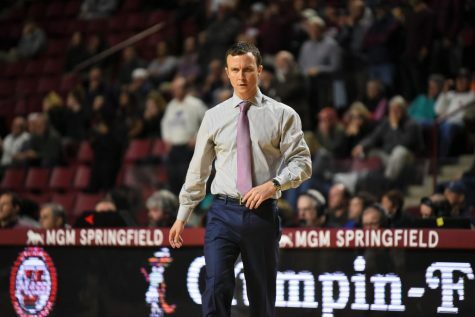 In addition to the newcomers on the floor, the Minutemen made a change to the coaching staff, promoting Shyrone Chatman to assistant coach after serving as director of player personnel for three seasons. 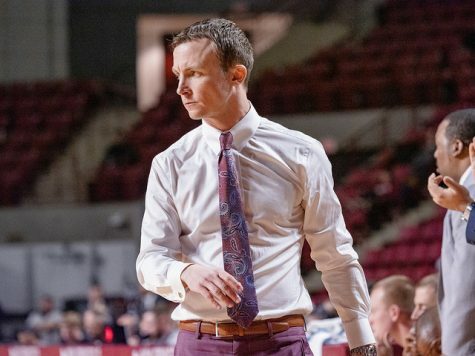 The 2002 Memphis graduate replaces Vance Walberg, who leaves UMass after three seasons to pursue other opportunities. Kellogg said Chatman’s relationship with the players made him the ideal candidate. “He has a good way about him with the team and I thought that was important to have a guy that the kids can trust, rely on and was there for them …” said Kellogg. 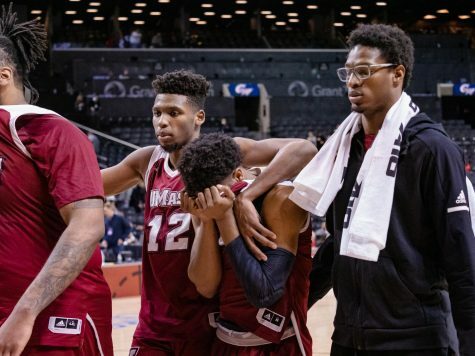 Chatman will also help UMass with recruiting, having served as the assistant recruiting coordinator at Memphis in the 2007-08 season that saw the Tigers reach the NCAA National Championship game. His influence and experience should help with recruiting in the Memphis area, lightening the load and traveling for Kellogg. With all the depth on the Minutemen roster, Kellogg believes there isn’t a great discrepancy between the starting five and the second five coming off the bench. UMass gets its first shot to go to battle as the Minutemen welcome Elon to the Curry Hicks Cage on Friday at 9 p.m.